Thank you for registering with us! You now have full access to the listing details with photos for the properties that our team has found to be the very best NEW LISTINGS and the BEST DEALS currently on the market all along the Riviera Maya. What will we do with your email? We will send you emails about new listings that we think may be of interest to you. You will also receive our monthly newsletter and occasional notifications of special DEALS and PRICE REDUCTIONS. If at anytime you want to unsubscribe or change the types of messages you receive from us, just let us know! Click on the images below to navigate to the complete photo listing on our website or contact us for more information. Whether you are looking for a retirement home, a vacation getaway or an investment with great income potential, our team of sales professionals can find you the best property to meet your specific criteria and within your budget. Contact us today! This new construction for sale in Tulum is available now for pre-sale purchase. Whether you choose a one or a two bedroom condominium you will appreciative the well constructed spaces and intelligently designed flow of the living areas. Each unit will have en suite bathrooms, large bedrooms, bright and airy spaces with large windows, open air private spaces and beautiful shared common areas. The pool area and gardens are designed to be beautiful as well as functional while integrating modern design with the natural tropical environment. Enjoy the lush tropical jungle of the Riviera Maya in the laid-back beach town of Tulum, Mexico in this brand new condominium residence. Enjoy downtown living at it's finest with your finger on the pulse of the lively 5th Avenue. Because of its superior location, this condominium is perfect to be used as a vacation rental, or for anyone who likes to be right in the heart of the action. This central location allows freedom of movement on foot or bicycle in the most vibrant part of downtown Playa del Carmen. With a lovely common pool area just steps from the front door and the world-famous white sand beach and turquoise Caribbean Sea only a few blocks away, you will delight in the tropical climate while staying cool and refreshed. Stroll along the colorful 5th Avenue with its many shops and galleries or enjoy people watching from a street-side cafe or restaurant. 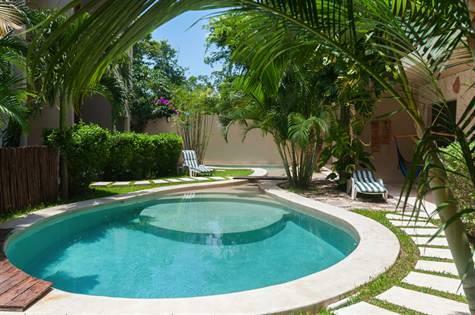 Located just 1 block off the world-famous, white-sand beach of Playa del Carmen! Coco Beach is a quiet section of beach that is one of the most up-and-coming and desirable locations in this rapidly growing beach town. This delightful 1 bedroom penthouse condominium is bight and cheery with balconies off the front living area and off the master bedroom that overlook the lush tropical gardens and common pool area. This penthouse condominium is being sold fully furnished and ready to accept your first vacation rental guests. This is an excellent turnkey opportunity! With an wonderful vacation rental history you are sure to receive a attractive annual return on your investment. Lot for sale on the beach in Tankah III. Tankah is situated between Tulum and Akumal, just south of one of the most celebrated vacation destinations in the world, Playa del Carmen. This property is set along the famous white sandy beaches of the Caribbean Sea and located just 300 yards from the fresh water Cenote, Manatee. This is a residential lot perfect for building a fabulous vacation home in one of the most exquisite and protected areas in the Riviera Maya. This lot for sale is priced to sell and well below the market value. This 905 square meter lot also offers 20 meters of beach with a magnificent view of Soliman Point in north Tankah Bay and is within walking distance of the Great Caribbean Reef. Tankah Bay boasts a tranquil laid back environment with the outer reef protecting the bay providing calm waters perfect for snorkeling, diving and kayaking. 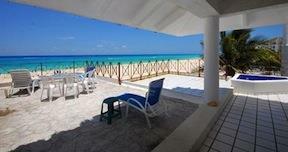 This is a beautiful 2 bedroom, 2 bathroom oceanfront condominiums for sale in Playa del Carmen. Offering expansive views of the Caribbean from the living room and bedroom as well as 180 degree views of the beach from the large front terrace, this spacious 1800 sqft condominium is a rare find in Playa del Carmen real estate. Both bedrooms have ensuite baths which have been recently refinished and re-tiled. This beachfront condo is being sold fully furnished and equipped including a gas stove and cook-top, and laundry facilities. 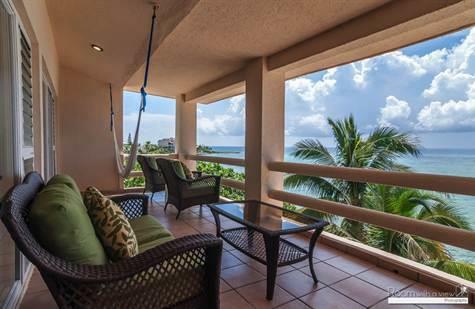 This condo is situated oceanfront in the heart of old Playa del Carmen, near the old zocalo. The ferries to Cozumel which run hourly are just 2 minutes walk from your front door. Spend the afternoon people watching from your private oceanfront Jacuzzi or stroll up to 5th Avenue in to enjoy all that Playa del Carmen has to offer. 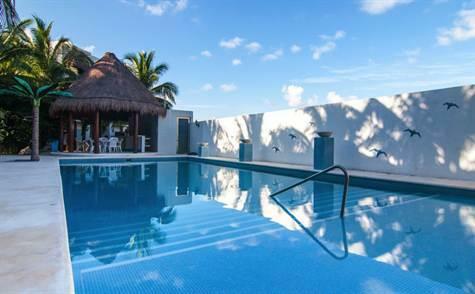 Now for sale in Half Moon Bay in Akumal is this charming two bedroom and two bathroom condominium. Half Moon Bay in Akumal is a premier vacation destination known world-wide for its tropical beauty, pristine white sand beaches and incredible Coral Reef protecting the bay. 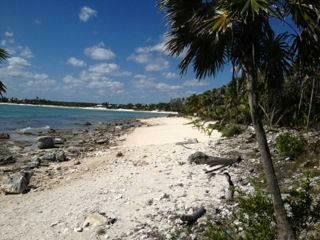 This is an excellent opportunity for a smart investor looking for great ROI potential in the beautiful Riviera Maya. This spacious condo features an open living and dining area, a fully equipped gallery kitchen and breakfast nook. The master bedroom has an ensuite bathroom with a unique sunken tub. The large shutter window in the master suite overlooks the living area, allowing spectacular views of Half Moon bay. The guest bedroom has two double beds and an ensuite bathroom allowing plenty of room for your guests.The grounds of the building are very well kept, with lush tropical landscaping and an oceanfront pool. 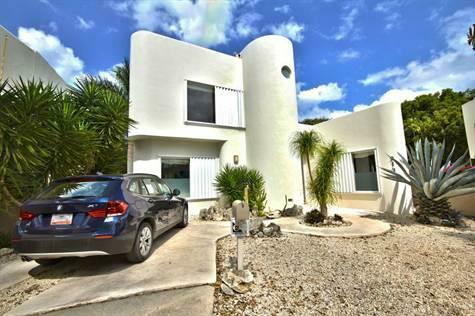 Located on a quiet cul de sac near the tennis courts of Club Real II in Playacar, this spacious, 3 bedroom 3 bathroom, energy efficient home was built by the renowned Architect and builder, Jose Luis Limon. The creative distribution of living spaces in this lovely modern styled villa create a bright, open, airy atmosphere with clean lines. The architectural details such as, high ceilings and marble counter tops along with custom made cabinetry and solid wooden doors give this villa a chic contemporary feel. 3 large sliding glass doors open onto a fantastic wrap-around terrace that overlooks the beautiful maintenance-free, tropical desert garden filled with succulent plants native to the region. This low maintenance, energy efficient house is perfect for part-time or full time living. This home is perfect for a family looking to move permanently to Playa del Carmen or an excellent opportunity for a smart investor to own a vacation rental in one of the most popular destinations in the world, with excellent ROI potential. This spectacular 5 bedroom, 5 bath home is now for sale in the most prestigious neighborhood in Playacar, Club Real. 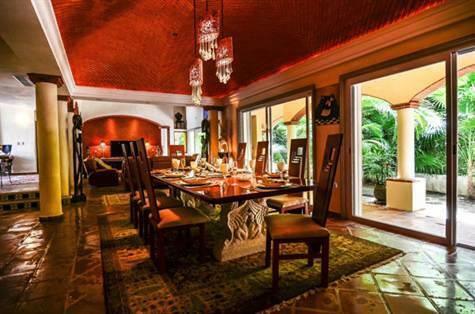 Fusing traditional Spanish structure with Indian/Asian influenced decor, this home offers plenty of style and space to please even the most discerning buyer. Upon entering this stunning home, you will be captivated by the high ceilings, intricate wood finishings and unique details built in. You will also observe that there are several exceptional sitting areas throughout the property making this ideal for a large family or those who enjoy entertaining their guests. The generous kitchen provides plenty of opportunity to prepare magical meals and the inimitable dining area will thrill your guests as you enjoy your evening gatherings. Each bedroom and bathroom is designed with rich bold textures and layers of distinctive traditional Mexican-Spanish flooring, tiles and fixtures. The beautiful stairway and immaculate upper level will lead you to the bedrooms each with their own personality. Will you settle for nothing less than the very best? Are you looking for the most exclusive and luxurious residence in all of Playa del Carmen? This stunning California-style contemporary 4 bedroom/3.5 bath home in the exclusive gated community of Club Real is exactly what you need. The main living area is sleek and stylish and every surface in finished with top of the line materials. The main entrance to the home boasts dramatic custom-made stainless steel doors. Inside, gourmands will appreciate the custom designed Quetzal island kitchen with Silestone countertops, Subzero and Electrolux stove, dishwasher, microwave and convection oven. The kitchen and baths are fitted with Koehler and Hansgrohe fixtures. The residence has zoned A/C, 9mm laminate glass and 70cm Italian tile floors throughout. The owners have fitted the home with high quality Hunter Douglas electric blinds, fully pre-wired audio/flat screens, satellite and security system and a full LifeFitness gym.